Synonymous with their majestic antlers, which can span 6 feet across in males, moose are found exclusively in the Northern Hemisphere. The biggest members of the deer family, moose have a circumpolar distribution. Some taxonomists recognize two species of moose: Alces americanus of North America and Alces alces of Europe and Asia. There exists a debate, however, over whether the former is actually a subspecies of the latter. In North America, moose can be found all across the continent's northern tier, including Alaska and large swaths of Canada. Their range extends south into the continental United States, where they inhabit parts of New England in the east; in the west, they can be found as far south as Rocky Mountains of Colorado. The Eurasian moose, also known as the Eurasian elk, has a continuous range that encompasses all of Scandinavia and extends east to Siberia and south to parts of several countries in mainland Europe and Asia, including Poland, Germany, Estonia, Latvia and Lithuania, China, Kazakhstan and Mongolia. A small population of moose once lived in Austria, but it is now believed to be extinct. 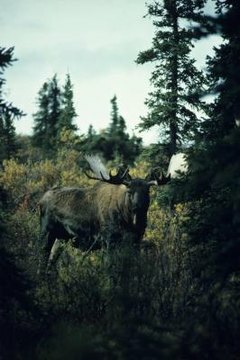 Moose occur in several biomes, including tundra, taiga and temperate forests. They gravitate toward areas of secondary forest where disturbances -- either human activity or natural processes -- make vegetation copious and accessible for consumption. Moose have a preference for regions where the snow accumulation reaches 2 feet in the winter. Able swimmers, they generally live near bodies of water, including rivers, lakes and swamps, where they feed on aquatic plants during the warmer months. Moose are corpulent animals -- a male, or bull, can weigh more than 1,300 pounds -- and they are unable to sweat. Moreover, their digestive processes generate heat as a byproduct. As a result of these factors combined, moose cannot tolerate external temperatures of more than 80 degrees Fahrenheit for extended periods of time, which limits the southern reach of their ranges. In the summer, moose will seek shade or immerse themselves in ponds and streams to regulate their body temperatures. Two U.S. states, Alaska and Maine, recognize the moose as their official state animal. What Is the Difference Between Elk, Moose and Deer?